The clarity and simplicity with which Jesus preached His message makes salvation understandable to even the youngest child. Yet all students of the Bible agree that while the majority of Christ’s teaching is readily accessible, a few of His statements require more study if we hope to understand them properly. In this series, R.C. 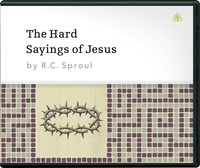 Sproul covers five of the hard sayings of Jesus. With careful attention to original context, Dr. Sproul helps us to understand the meanings behind these sometimes perplexing teachings and how they contribute to our doctrines of God, sin, and salvation.